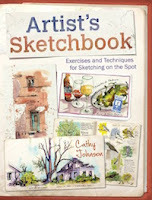 Many of the watercolor sketches and paintings that I feature on this blog are done in my Canson Montval sketchbook. The official product name is "Canson Montval All-Media Book." The sketchbook is spiral-bound, and includes 90-lb paper. I often receive comments from people that get frustrated when using their Canson sketchbook; most comments are usually related to the paper buckling when washes are applied. I will admit that my pages also buckle, but only very slightly. The trick with the Canson Montval All-Media book is to use less water. Use thicker paint than that which you're used to. And, when pre-wetting an area with clear water (such as sky) use a very light layer of water. If you're having a problem with page buckling, try using a little less water, and I think you'll be happier with the sketchbook. 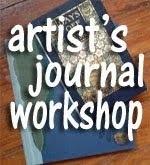 In fact, the key tricks of less water & thicker paint will allow you to use watercolors in a wide variety of sketchbooks, especially those that feature lighter weight papers. I have even used this technique successfully on copier paper! Another trick I use is to clamp down the pages with binder clips. You can see an example of this in the photo above. 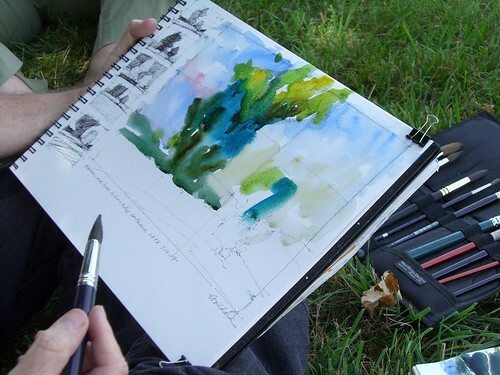 This is a photo of Joseph Stoddard painting plein air, from whom I took a workshop in 2007. In fact, I have gotten into the habit of using binder clips in all my sketchbooks, not just the Canson Montval All-Media book. The clamping helps prevent buckling and curling of the page, and once it dries, it will lay flat. Give these tips a try and let me know how they worked for you! There's other stuff on my Flickr photostream.